In observance of the unusual American tradition of Groundhog Day, we made some cute yet creepy critter cupcakes resembling the woodchuck weather forecaster. Our candy “groundhog” appears to be bursting from a burrow of a chocolate cupcake iced with snow white frosting. According to folklore, if a groundhog emerging from its underground home on February 2 is not frightened upon seeing its shadow, it will leave the hole, signifying that winter will soon end and spring will come early. But if the groundhog sees its shadow and goes back into hiding and hibernation, it is predicted that winter will continue for six more weeks. This custom parallels some beliefs about Candlemas or the Presentation of the Lord Feast Day, when Mary and Joseph brought out baby Jesus to the temple 40 days after his Christmas birth after hiding in Egypt from the evil King Herod. Just as the groundhog is a sign for things to come, so is Jesus the Messiah. Temple Elder “Simeon blessed them and said to Mary, his mother: ‘This child is destined to cause the falling and rising of many in Israel, and to be a sign that will be spoken against, so that the thoughts of many hearts will be revealed.’” (Luke 2:34-35 NIV). 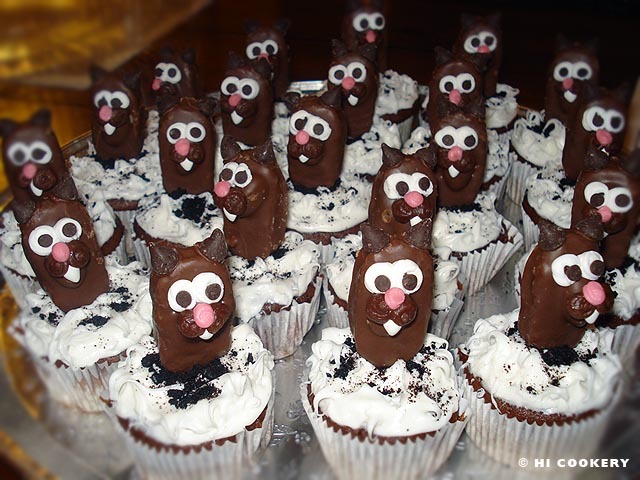 Who knew that Groundhog Day cupcakes could also be edible evangelism? 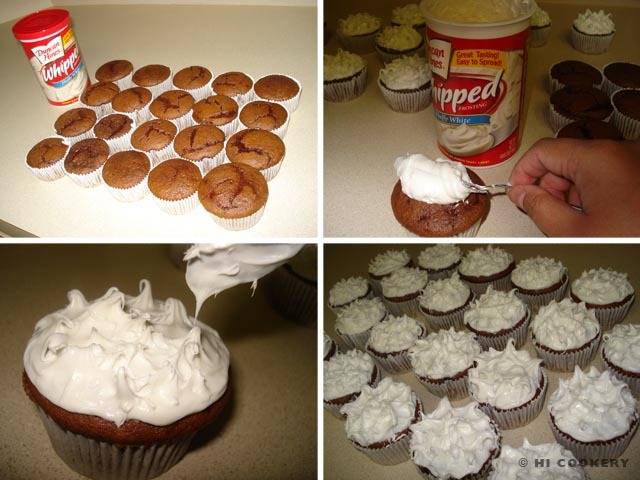 Bake and cool the chocolate cupcakes. Generously spread the tops of the cupcakes with vanilla frosting, pulling upwards to create fluffy points (this gives the illusion of the groundhog bursting up from its snow-covered burrow). 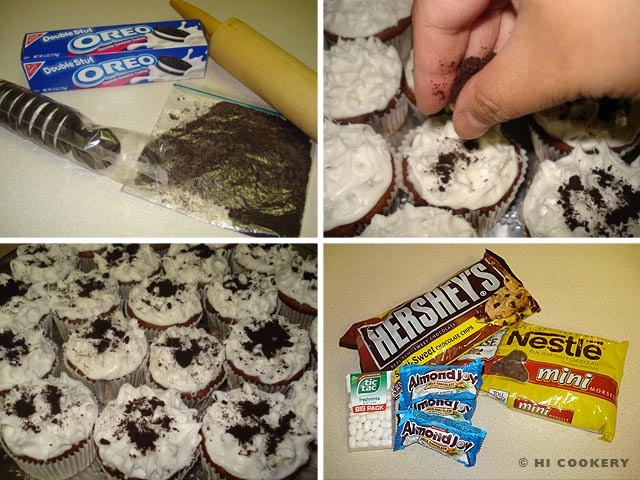 Put 3-5 Oreo cookies in a plastic bag, letting the air out as much as possible. Use a rolling pin to crush the cookies into fine crumbs. Sprinkle on top of the frosted cupcakes. Set aside. 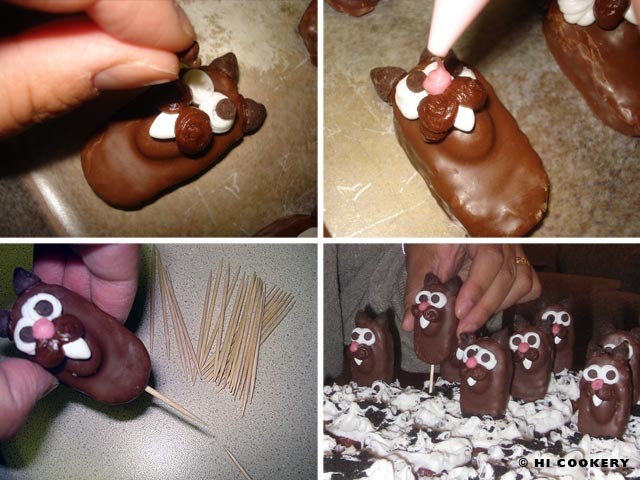 Create an assemly line to make the groundhog candy toppers by preparing the rest of the ingredients. Dab a small amount of chocolate tube icing on two regular size chocolate chips and a Tic-Tac breath mint to secure the ears and tooth to the mound on the Almond Joy. Pipe two rounds of chocolate cheeks over the Tic-Tac breath mint. Use the white tube icing to make the eyeballs. Place two mini chocolate chips, points down, on the white eyeballs to make the pupils. Complete the groundhog’s face by piping a small round nose with the pink tube icing. Add a toothpick to the bottom end of the groundhog candy topper. Insert it into the middle of the frosted cupcake. Present the Groundhog Day cupcakes on a platter to serve. Punxsutawney Phil from Pennsylvania is the nation’s most popular woodchuck weather forecaster. Read more about the groundhog’s predictions for a late or early spring at PunxsutawneyPhil.com or Groundhog.org. 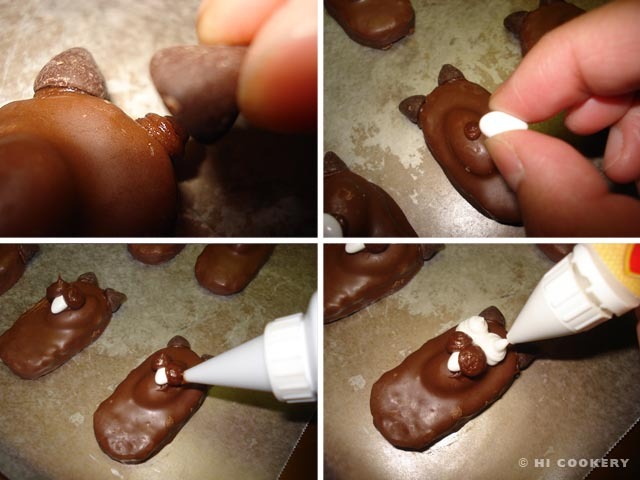 Substitute the chocolate chips for mini chocolate M&M’s to make the ears and cheeks of the groundhog. Or just pipe them in with the chocolate tube icing outfitted with a small round tip.